A Blue Dasher (Pachydiplax longipennis) exuvia was received from Andy Davidson, a graduate student at Virginia Commonwealth University. Test shots of the specimen were taken using a relatively small aperture of f/20 for greater depth of field. Each photo is a “one-off,” that is, not a composite image. Focus stacks will be created sometime in the near future, after the exuvia is rehydrated and posed for better composition. Extremely shallow depth-of-field is a common problem in macro photography. Depth-of-field increases as aperture decreases — in other words, they are inversely related. In this case, an aperture of f/20 was insufficient for the entire subject to be acceptably in focus so it will be necessary to create some focus stacks. Precious cargo, a blog post by Walter Sanford. The following equipment was used to shoot both of the macro photographs featured in this post: Fujifilm X-T1 digital camera; Fujifilm MCEX-11 extension tube; and Fujinon XF80mm macro lens. The camera was set for both manual exposure and manual focus. That’s right, a switch on the camera body is used to set the type of focus. It’s a Fujifilm thing. Actually, back-button focus was used to autofocus the image and adjusted manually as necessary. That’s also a Fujifilm thing. A Godox XProF radio flash trigger, mounted on the hotshoe of my X-T1, was used to control a pair of off-camera Godox TT685 Thinklite TTL Flashes (TT685F and TT685C) set for radio slave mode. Each flash was fitted with a snap-on plastic diffuser. Adobe Photoshop CC 2017 was used to spot-heal and sharpen both images. Copyright © 2018 Walter Sanford. All rights reserved. 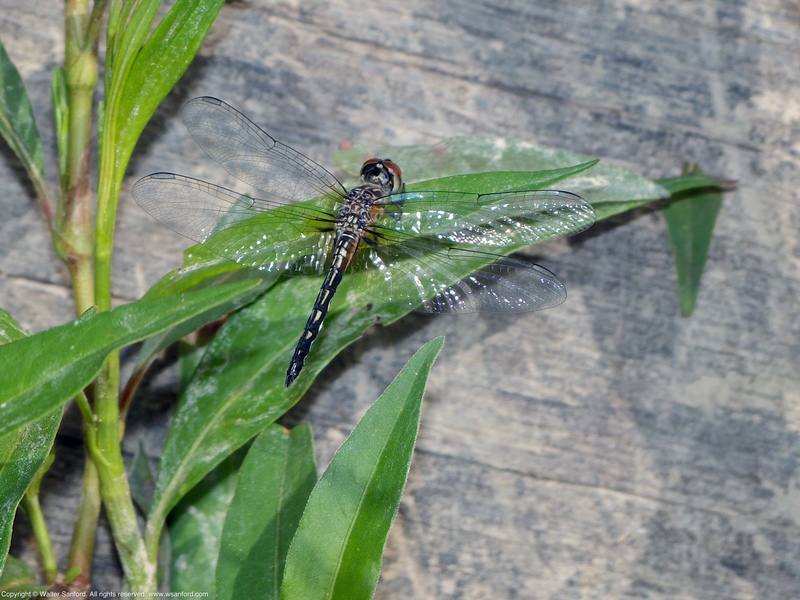 A Blue Dasher dragonfly (Pachydiplax longipennis) was spotted during a photowalk at Occoquan Regional Park, Fairfax County, Virginia USA. This individual is a female, as indicated by her coloration and terminal appendages. This camera-shy girl was hiding her face from me behind the thin veil of her left forewing. Blue Dasher (Pachydiplax longipennis) is another summer species of odonate that appears in Northern Virginia in late spring. 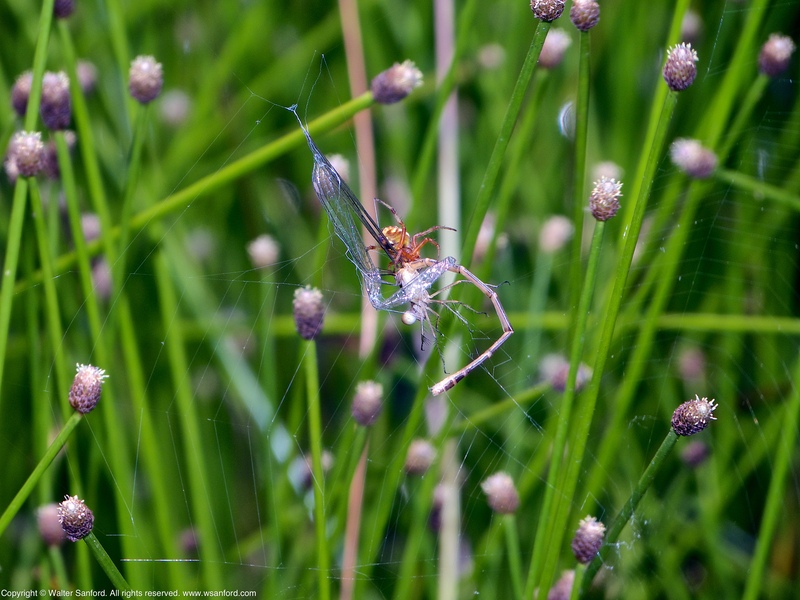 The following individual — spotted at Hidden Pond during a photowalk at Meadowood Recreation Area (MRA), Fairfax County, Virginia USA — is a male, as indicated by his coloration and terminal appendages. 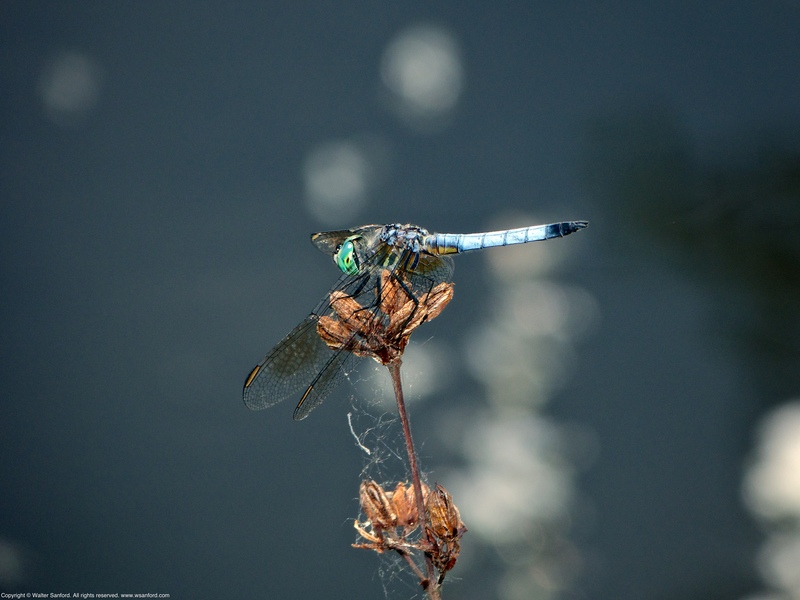 Blue Dasher is a habitat generalist that “can be found almost anywhere there is still water.” Source Credit: Species Pachydiplax longipennis – Blue Dasher. 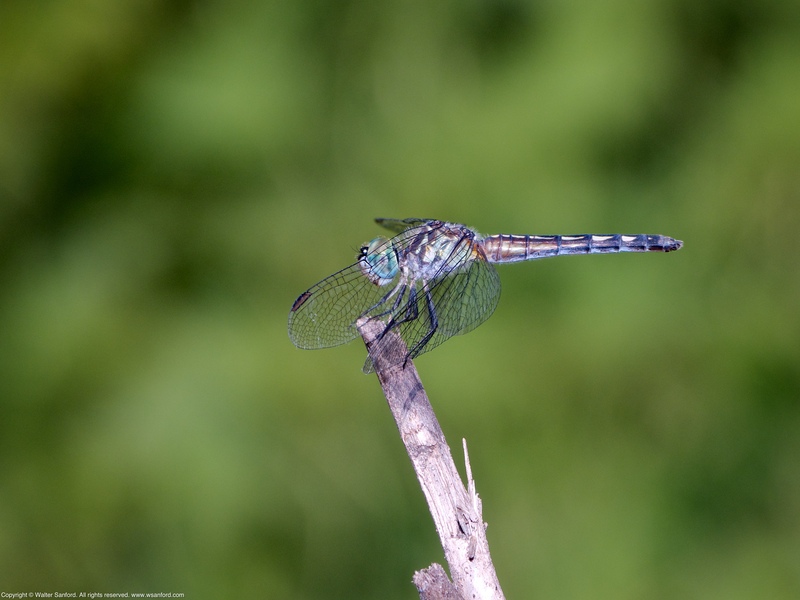 As I mentioned in my last two blog posts (see Related Resources, below), most of the Skimmer dragonflies (Family Libellulidae) spotted during a recent photowalk at Huntley Meadows Park looked old and tattered. 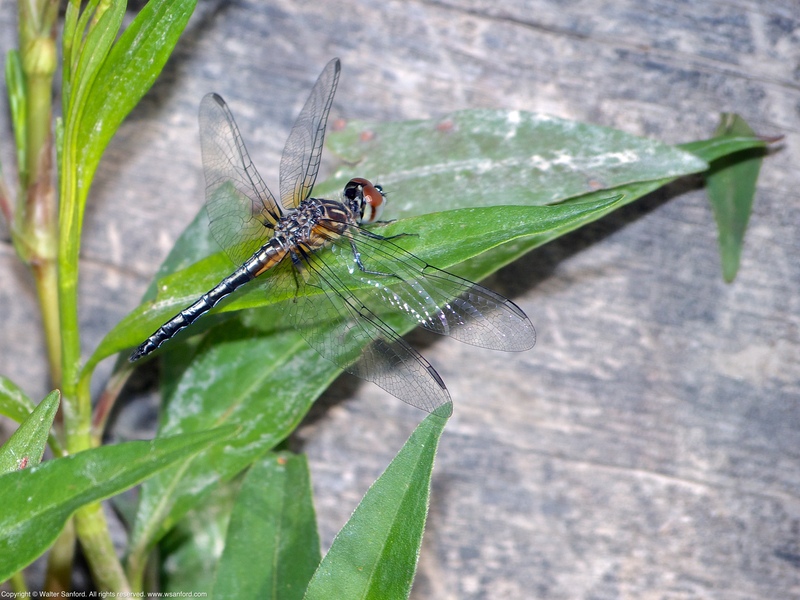 This individual is a mature female Blue Dasher dragonfly (Pachydiplax longipennis), as indicated by her terminal appendages, discolored abdomen, and tattered wings. 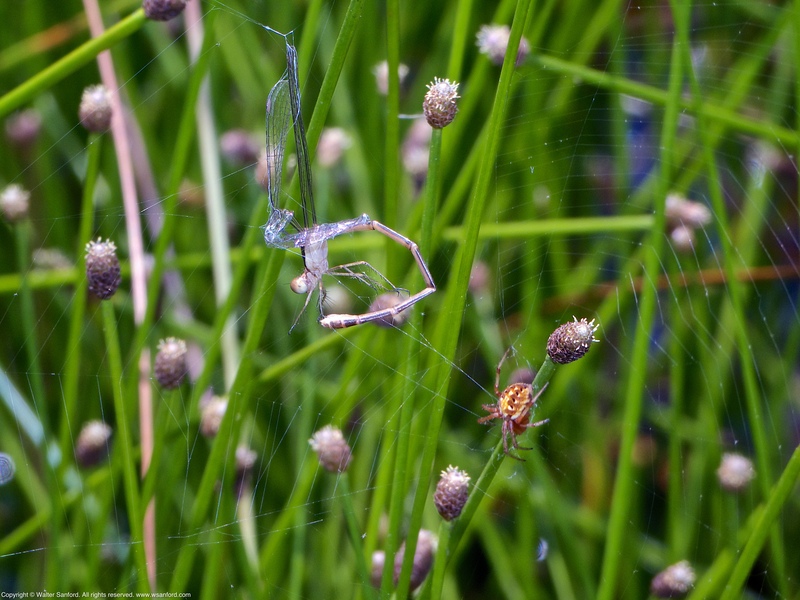 A spider was observed preying upon a teneral damselfly at a vernal pool in Huntley Meadows Park. The genus/species of the spider is uncertain; the damselfly appears to be a female Slender Spreadwing (Lestes rectangularis). According to experts on the BugGuide Facebook group, the spider is probably an unknown species from the Family Araneidae (Orb Weavers). 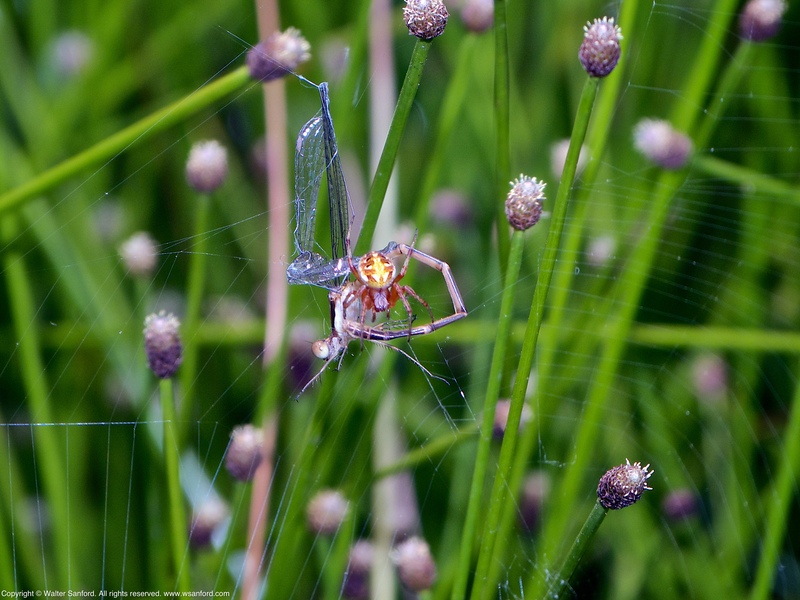 Post Update: Ashley Bradford, a local arachnid expert and excellent all-around amateur naturalist, identified the spider as an Arabesque Orbweaver (Neoscona arabesca). Thanks, Ashley! Aperture Priority mode was used for the next photo, in order to increase the depth of field. As you can see, the depth of field at f/8.0 was insufficient for both the damselfly and spider to be in focus. 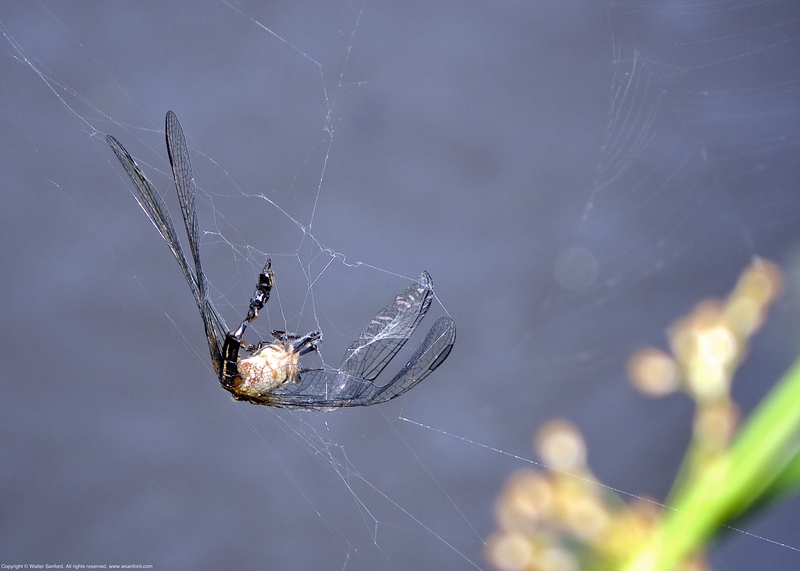 A dragonfly was trapped in a spider web at Hidden Pond, Meadowood Recreation Area, Fairfax County, Virginia USA. 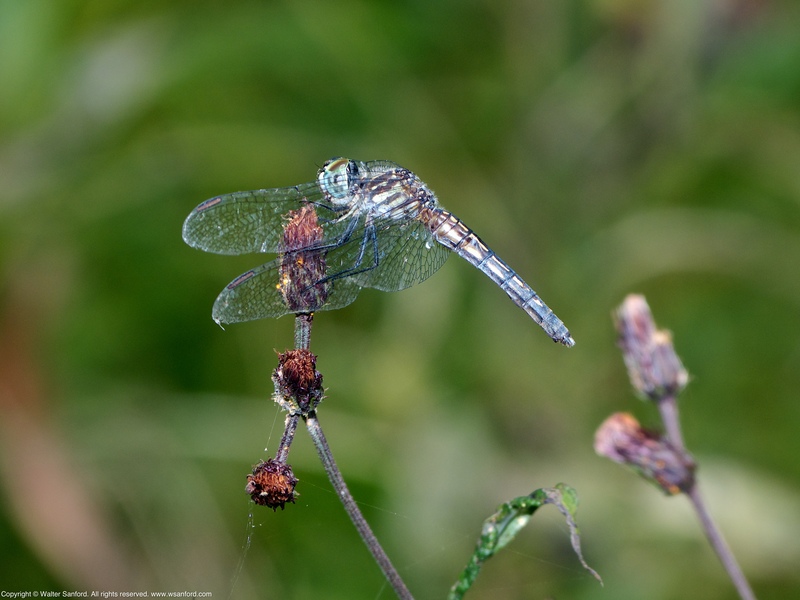 The dragonfly, possibly an immature male Blue Dasher (Pachydiplax longipennis), is infested with parasitic red water mites. 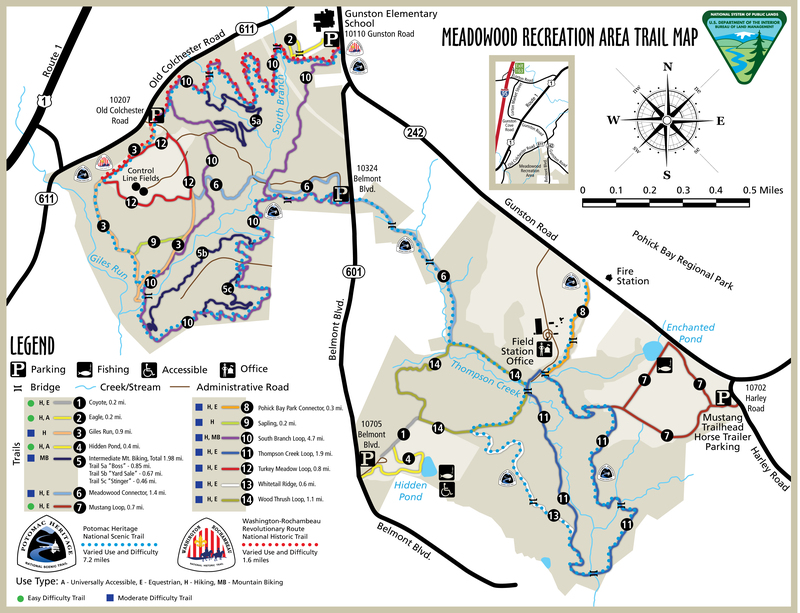 Two species of teneral dragonflies were spotted on the same day at nearly the same location in Huntley Meadows Park. 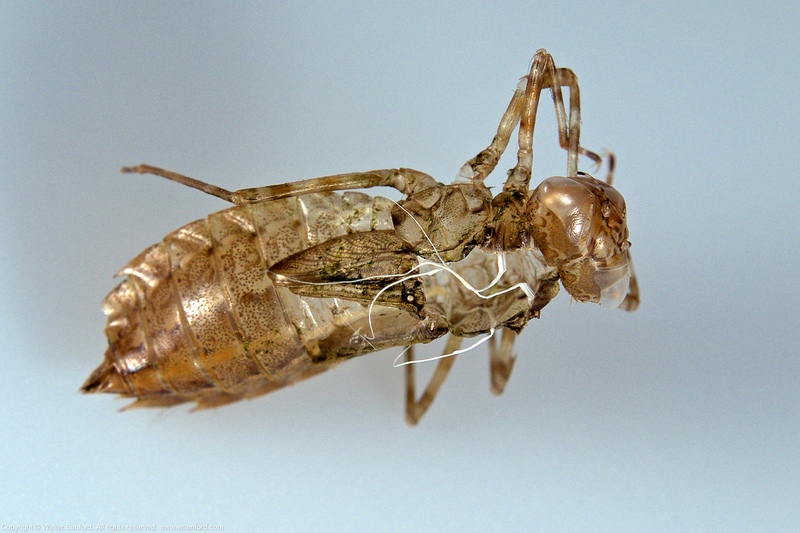 teneral: adult after it has just emerged, soft and not definitively colored Source Credit: Glossary, Some Dragonfly Terms by Dennis R. Paulson. 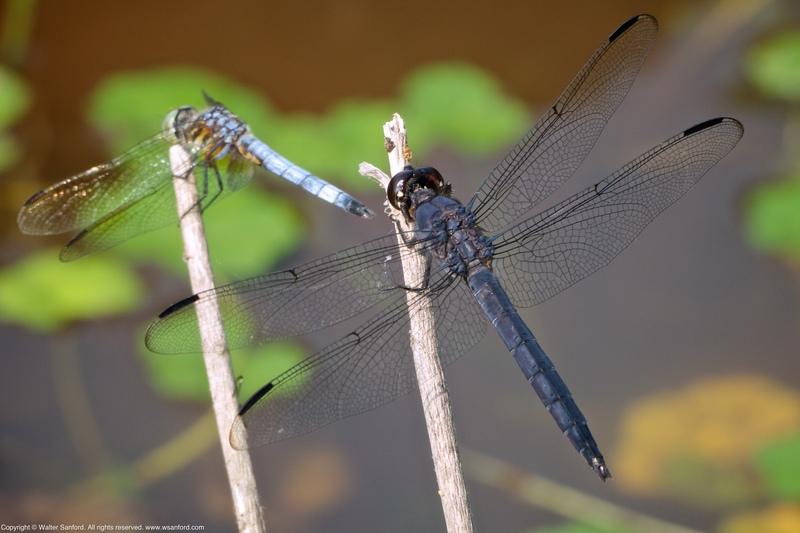 Both species are members of the Family Libellulidae (Skimmers). Based upon my experience, early September seems late in the year for these two species to emerge! This individual is a teneral male Blue Dasher dragonfly (Pachydiplax longipennis), as indicated by his terminal appendages, coloration, and the tenuous appearance of its wings. The coloration of immature male Blue Dashers resembles females of the same species. 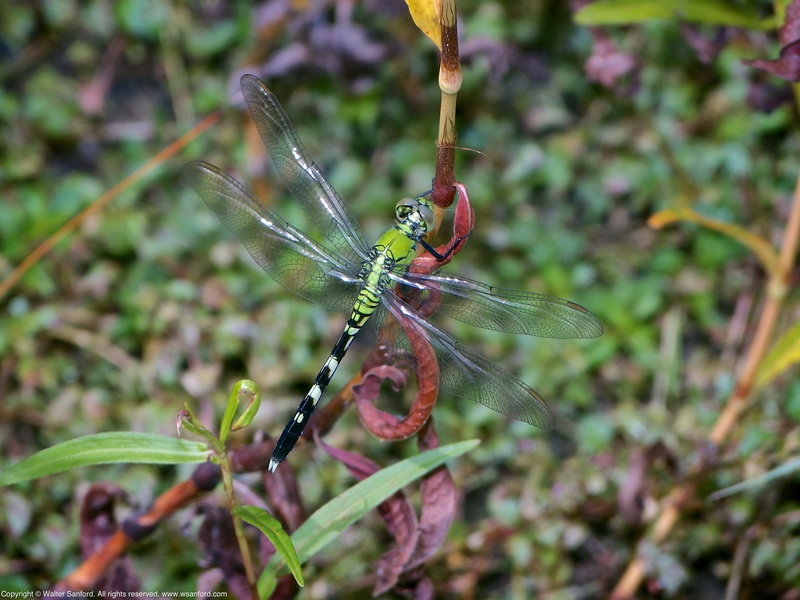 An Eastern Pondhawk dragonfly (Erythemis simplicicollis) was spotted near the same location where the Blue Dasher dragonfly was observed. This individual is a teneral male, as indicated by his terminal appendages, coloration, and the tenuous appearance of its wings. 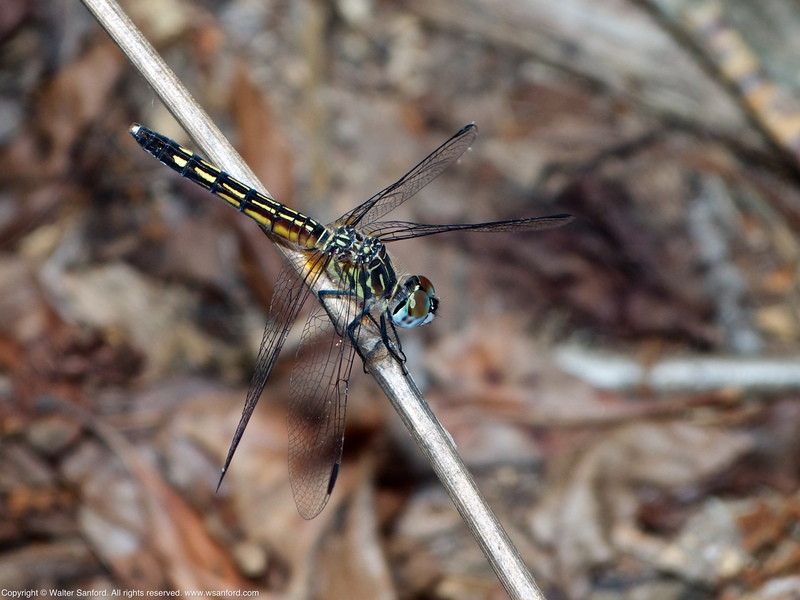 The coloration of immature male Eastern Pondhawks resembles females of the same species. I’ve said it before — when you’re making a list of the “Top 10 Most Beautiful Dragonflies of the Mid-Atlantic USA,” don’t sleep on the female Blue Dasher dragonfly (Pachydiplax longipennis). I think it’s easy to overlook their beauty because Blue Dasher is a relatively common species of dragonfly — males seemingly more common than females — but I think the females are uncommonly attractive. 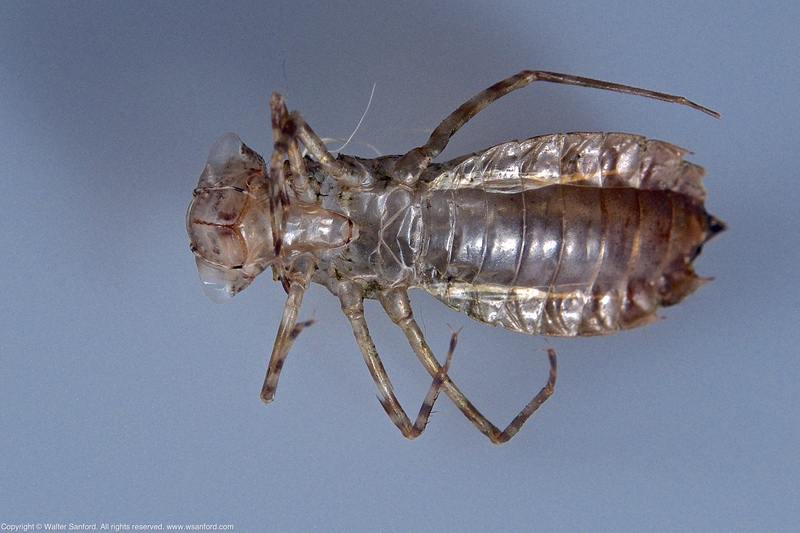 The individual shown in the preceding photo is a female, as indicated by her coloration and terminal appendages. Blue Dashers display sexual dimorphism; terminal appendages may be used to differentiate females from immature males. Copyright © 2015 Walter Sanford. All rights reserved. 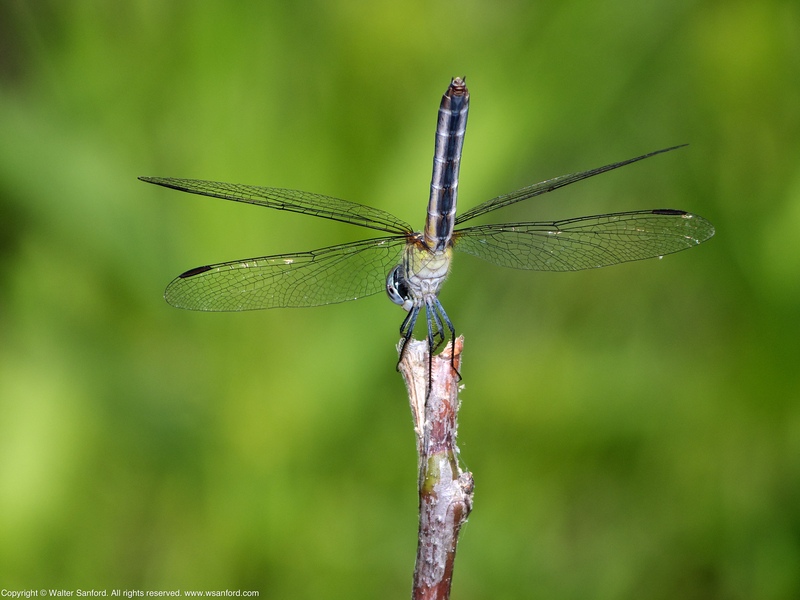 A Slaty Skimmer dragonfly (Libellula incesta) was spotted at Huntley Meadows Park. This individual is a mature male, as indicated by its coloration and terminal apppendages. A male Blue Dasher dragonfly (Pachydiplax longipennis) is shown in the background. These two males were rivals, competing for one of two perches overlooking a wetland pool. I was amused by the smaller Blue Dasher’s aggressive behavior as he buzzed the larger Slaty Skimmer repeatedly, trying to recapture the prized perch he occupied before the Slaty showed up. 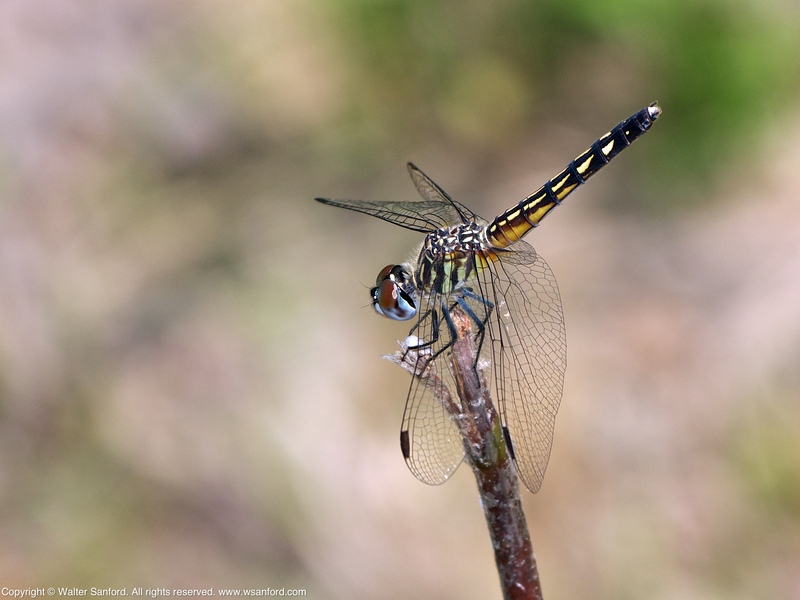 Seems like just yesterday Blue Dasher dragonflies (Pachydiplax longipennis) were everywhere. Now they’re nowhere to be found. (Heavy sigh.) It’s going to be a long winter! This individual is a fresh-faced female, as indicated by her coloration and terminal appendages. Some species of dragonflies, such as the Blue Dasher shown in this photo set, regulate their body temperature by perching in the “obelisk position”: the tip of the dragonfly’s abdomen is pointed toward the Sun, minimizing the surface area of the body exposed to direct heating by the Sun’s rays, thereby avoiding overheating. 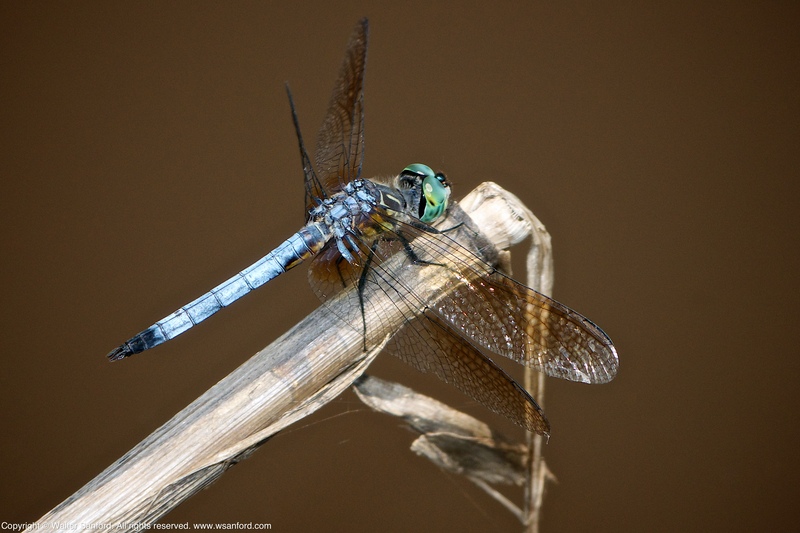 In a recent blog post, I wrote about seeing the beauty in a common dragonfly. Blue Dasher dragonflies (Pachydiplax longipennis) are so ubiquitous in the wetlands of Huntley Meadows Park, it’s easy to get desensitized to their beauty. This individual is a handsome male, as indicated by his coloration and terminal appendages. He posed for me when I stopped to rest during an “extreme photowalk” with Michael Powell. Actually, the male Blue Dasher was posing for females looking for a mating partner. The coffee-colored water in the background — the result of recent heavy rainfall — enabled me to create a photo with a clean, uncluttered background that focuses the viewer’s attention on the subject, as it should be. The water color also complements the coloration of the dragonfly.